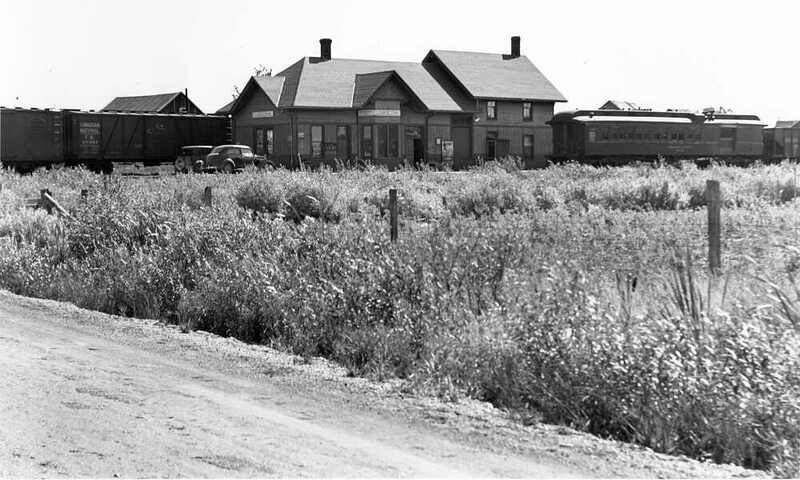 The majority of early Ontario (Upper Canada) rural stations were simple wooden frame buildings, often considered as “temporary” facilities, although some of them lasted until their general disappearance in the 1960s after the termination of the mail contracts and local passenger service. Their design was usually to a standard pattern by the railway that built them, with little variation except perhaps for the width of the building and/or the length of the baggage / freight room depending on the amount of traffic from the community it served. Typically the interior would be divided into a waiting room, agent’s and ticket office, and a baggage / freight room. Sometimes it would be year or two after the line was opened for traffic before the station would be built, in the meantime making do with a simple shelter or just a platform. As traffic grew and the communities became prosperous, the vast majority of the early stations were replaced or rebuilt. Loss by fire, whether by lightning, carelessness or sparks from the early wood-burning locomotives, was also a significant hazard and cause for replacement. At the same time, the early pioneering roads were being amalgamated into larger companies, with the result that significant or total design change would occur. Add to that both railway and civic pride and competition, which stimulated the addition of such features as separate ladies’ waiting rooms, turrets, platform canopies, dormers, “gingerbread” bargeboards and roof finials. In many instances, where a station was replaced (such as at Uxbridge), the earlier building would be converted for use as a separate freight shed, with the corresponding space in the new building serving as a baggage room only. Another feature that came to be added to all stations by the turn of the 20th century was a telegrapher’s bay so that the operator had a clear view up and down the line without having to step outside the building, an operational necessity as the number of daily trains increased. A “soft” additional benefit to the railway (and for the agent) was that a dwelling for the station agent invariably resulted in additional unpaid labour as the agent’s family would pitch in with the office work, learn how to operate the Morse telegraph, look after the lighting of the station and signal lamps, and generally keep the place neat and tidy. And then there was the station garden, which was the agent’s pride and joy. There was much competition between stations for the best-kept gardens and the railways encouraged this with the awarding of prizes as this was in their interest as manicured gardens were a form of welcome to the traveling public. “Coby” was the terminus of the intended first phase of the Toronto & Nipissing Railway, a 3’6” narrow gauge colonization or development line that eventually was to reach Lake Nipissing for connection to the planned transcontinental railway. 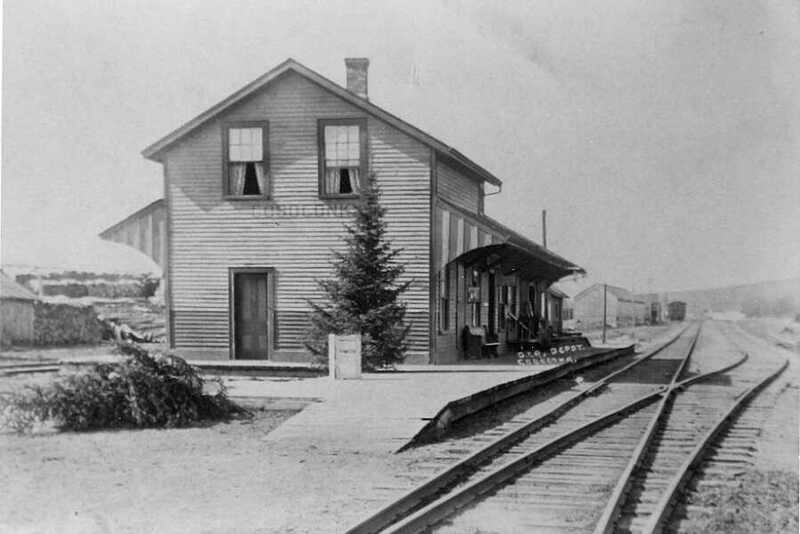 Nothing has come to light about the initial design of Coboconk’s first station, but it may have been built at first (in 1872 or 1873) to the standard simple Toronto & Nipissing Railway design, similar to the stations that have survived at Unionville and Markham. It is more probable, however, that it was rebuilt at some point (possibly in 1894) to the more commodious dimensions shown in the photographs of it that survive, namely with a second storey that accommodated the agent and his family, and with platform canopies with valances on both sides of the main portion of the building. (Stations to a similar design were built or rebuilt at Kirkfield and Victoria Road, and at Brown Hill on the Lake Simcoe Junction Railway [a subsidiary of the Toronto & Nipissing Railway]). It is also possible, but rather less likely, that this station was built with the two-storey design at the outset. In any event, this station succumbed to a lightning strike on August 4, 1908. Coboconk’s second station lasted until the end of service in 1965. Its design was in accordance with a popular pattern used by the Grand Trunk Railway in its station replacement program during the first decade of the 20th century, again with accommodation for the agent, but this time added to the station building, instead of being an integral component. After the lifting of track at the end of service, it served for a number of years as storage for a local building centre, before being moved to its present location in nearby Legion Park for restoration and use for community events. As such, it is one of ten survivors of the 60 or more railway stations that at one time served the various communities of the former Victoria County, now the City of Kawartha Lakes. For additional information about the pioneer Toronto & Nipissing Railway, please click here.